Rural Revolution: Nail (cough) "art"
This morning while feeding the cattle, I managed to break two fingernails. How I managed to do this through two layers of gloves is rather amazing, but there you go. I came back into the house and used a nail clipper to trim down the ragged edges. Such is life on a farm. But even before I had a farm, I confess I never had much patience with fancy fingernails. Once long long ago while trying to impress a beau, I had a manicure. I actually paid money for someone to buff my nails and push back my cuticles, as if somehow this would improve the looks of my square, short-fingered, practical hands. It made no difference that I could see (much less the beau), so I went back to ignoring my hands except to be grateful they both worked. Mainstream America is embracing wild forms of nail art like never before, thanks to the affordability and accessability of nail accessories. Click through the gallery to see samples from professionals and DIYers. Ahem. Mainstream America? Tell me, how on earth do you wash your hair with fingernails like these? Can you change a poopy diaper with these nails? And can you fathom the damage that would occur to an udder if I tried to milk a cow with these? Maybe all these women in "mainstream America" have maids and butlers who do all their housework, but for the rest of us, this "nail art" is stoopid to the point of lunacy. Oh wait, I forget -- much of this nail art is associated with "celebrity clients" who do indeed have maids and butlers to do all their dirty work. Not one of them does dishes by hand, changes a diaper, or vacuums a floor... much less mucks out a stall or weeds a garden. Didn't the Victorians wear a lot of those frilly/fruity clothes(guys and girls)to prove they were upper class didn't have to do any sort of dirty work? I've seen women with fingernails that looked like they were three inches long and wondered how they..performed some pretty basic hygiene ..to be nice. Twenty some-odd years ago I worked for an optometrist teaching pts how to wear contact lenses. 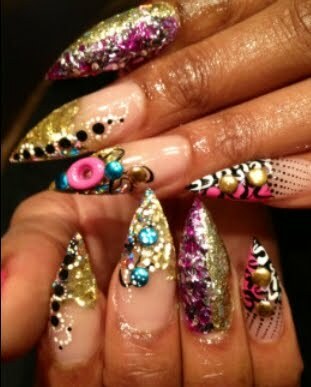 I had a lady that (kid you not) had 4" curved "talons". No way was she putting a contact lens in the regular way. I thought about it for awhile and taught her to stick the lens on the back of her fingernail. She did it! Being a long time contact wearer, I can see how that could work, but how the heck could you get them out/off your eyeballs? Have mercy! Just broke one of my nails down to the quick scrubbing my floors. I happen to believe the only way you can get a bathroom floor clean, is on your hands and knees. I try to keep my nails as short as possible. Being an artist they are always an intersting color!!!! They still have to wipe their rear ends. Patrice, I had going to say the same thing as your Anonymous blogger. I've seen healthcare professionals with fake nails, too. I believe a couple of nurses in Oklahoma had staph under their impossible-to-clean under fake nail tips and a couple babies died. How sad. 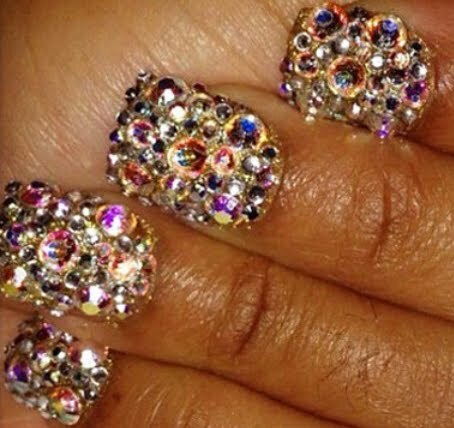 I would venture to say that many of the women getting this nail art do absolutely no work at all. They are also getting their nails done on my dime, more often than not. That makes me want to quit my job, but I still need to pay last year's property taxes so I can buy their kids laptops, while mine makes do with a 7 year old boat anchor of a desktop. So I can't quit my job, but by God I can vote. These are for those that have more cents then sense, and some may have more scents than others. I am groomer by trade and a jewelry artisian I gave up on my nails years ago. This post made me shake my head and laugh. And people wonder why America is in debt when they're buying riduculous things like this. i wonder if they need to maybe have their fingernails registered as weapons.. have you ever watched the office secretary type with nails like that or the store clerk ring up purchases... with nails like these i sure would not want to even wipe my arse much less scratch my nose. no thankyou, i have only had one manicure in my life and that was just to clip my nails when my hands were hurting with arthritis and i could not manage it myself. Years ago I used to work in downtown Chicago just east of the old 'Sears Building' and 4 or even 6 inch nails were short compared to what I saw while walking to work site. I only have two long nails; one on each thumb - use 'em as screwdrivers! BWAHAHAHA! I am howling at the thought of two screwdrivers always at the ready. I'm a nail tech that does mainstream America's nails. 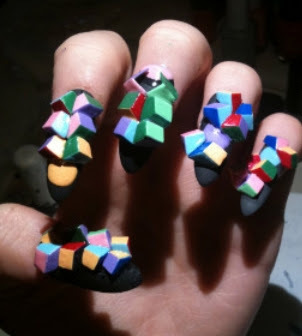 And, I can tell you I have never done nails like those. Lol! They need to get their "Mainstream America" checked out. Lol!!!! My mama always said that women that have their nails done, don't work. Enough said. Now see, I just came in from morning chores, and I'm thinking some of these nails would have come in handy. My older kids are away from home today, so the 10 yr old and I were handling all the chores. The cows (who had already been fed, by the way) were getting a bit pushy toward the little boy who was carrying the food to the hogs. They thought they could probably bully that food away from him, and I was having to stand between them and him, so they wouldn't make a rush for the pig food. I'm thinking that brandishing some of those nails would have scared the cows away. They might never have come back! As a former nail tech, I have to say this is a huge business (nail art). It's now to the point that nails (manicures, pedicures, and nail art) are considered a "necessity" to feel well groomed. Of course a woman could do these on her own, but HORRORS, it is so much "nicer" when someone else does these things FOR you (along with facials, waxing, hair care, etc.). It does speak of "money" and is twisted to imply you are "caring" for yourself. My mainstream American customers wanted not only neat, pretty nails, but a feeling *somebody* cared about them....sad commentary. Thankfully I was never "blessed" in having to create "extreme" nails for any of my clients. HA Those are simply too, too much. I remember once seeing Dolly Parton on television. She had fingernails that appeared to be an inch long. I wondered how in the world she could play her guitar with nails that long. Moments later, she picked up a guitar and played it! I was mesmerized. How was she doing that? She was changing chords and playing actual music! I can't imagine even being able to open my front door with nails like that.